Cleansing is the most important part of skin care. Our skin is always exposed to dust, dirt and pollution and thorough cleansing twice a day helps to refresh the skin and remove all the unwanted build up on the skin. I like trying out different products and home made ingredients as cleansers. I usually use face wipes or my recent purchase, Khadi cleanser to remove kajal (even though it doesn’t do that well) and cleanse face in the evening. But this time, I tried this body oil on my face and I was really surprised by its efficacy as a cleanser. It made my skin extremely soft and made it glow in just one use. 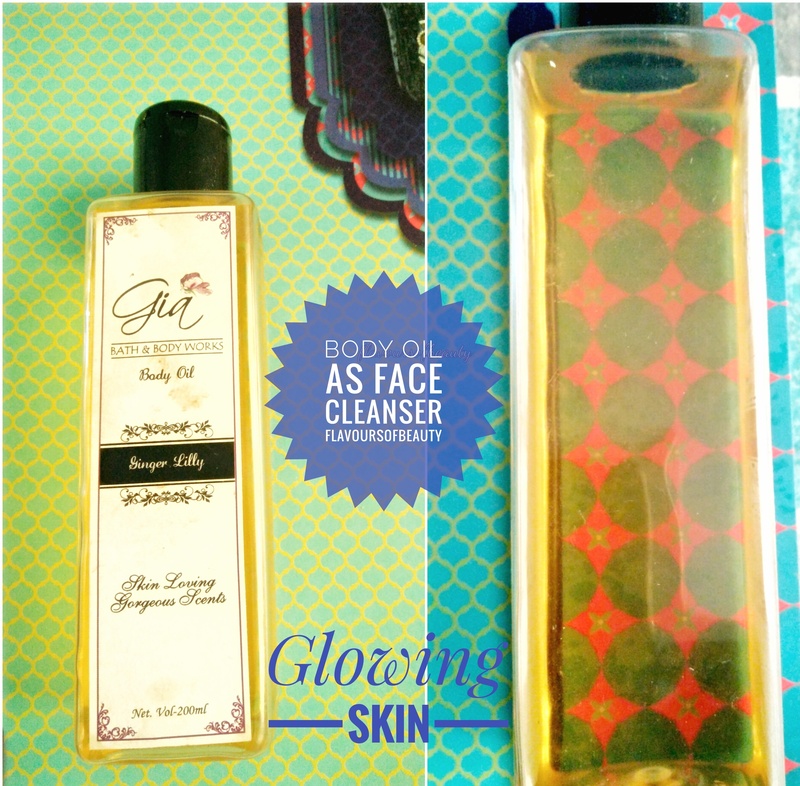 Many of us have combination to oily skin and doesn’t prefer to use oils on face. But let me tell you, you will be amazed at how some oils nourishes your skin without making it oily. There are serums and oils that are suited for oily skin, which even helps in reducing skin troubles like acne. Let me tell you how to effectively cleanse your face to get that soft dewy skin. Texture : Light and non-greasy. If your skin is not too dry, you can use replace body lotions/butters with this oil. Gets absorbed easily on skin and doesn’t leave shine on skin. Fragrance : I bought this oil to use as a pre-wash body oil as my body has dry skin. But this one is actually a post-wash moisturizing oil, as it is very light and has amazing fragrance (I think it has artificial fragrance as well). I washed my face with warm water as this softens up the skin helps loosen all dirt and grime on skin. After pat drying my face, I took few drops of this oil and massaged it well on my face. This one stings if it goes in your eye, so be careful. Leave it for a minute. Wipe off all traces of the oil with a soft tissue or a wet face cloth. I used the Tea cleanser from Cape of Good Soap, after this, to make sure my face is squeaky clean. You can skip this step in case your face feels quite clean already. I went on to make dinner and did not give it a second thought. After a while, I was surprised to see that my face had that dewy glow and did not feel oily at all. I am definitely making this a part of my skin care regime. Effectively cleanses face and doubles up as makeup remover as well. Gives my skin dewy glow and makes it super soft. You can try out other light oils like Jojoba oil and sweet almond oil based on your skin type and let me know if it works as effectively as this.